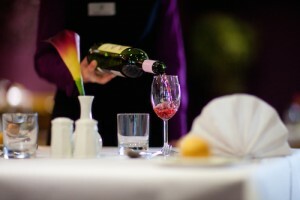 The Restaurant at Borders College is open most days of the week during term time for lunch and selected evenings for dinner. It is available to staff, students and members of the general public. Due to the increasing popularity of the restaurant, it is advisable to book in advance to avoid any disappointment. Please understand that this is a training restaurant and kitchen where the principal aim is to assess students on their practical skills in a realistic working environment. From time to time problems do arise and we appreciate your patience under these circumstances. All food in our menu is freshly prepared on a daily basis. It is our aim, a s far as practically possible, to use only Scottish produce. The student teams are led by a Head Waiter and Head Chef who are usually 2nd or 3rd year students. They act in a supervisory role under the auspices of the lecturer. The Head Waiter and Head Chef are responsible for the planning of the menu, ordering and preparation of the food, direction of their fellow students, cooking and service of the food for your lunch today. The Head Waiter and Head Chef are being assessed on their managing skills and abilities and we value any comments you wish to make. Please call 01896 662588 or email reservations@borderscollege.ac.uk for bookings and information.